Off to daycare or school? They’ll need a backpack! The beginning of the next school year will be upon us very soon and it’s time to start thinking about the products we’re going to need so our children can attend daycare, pre-school and school. 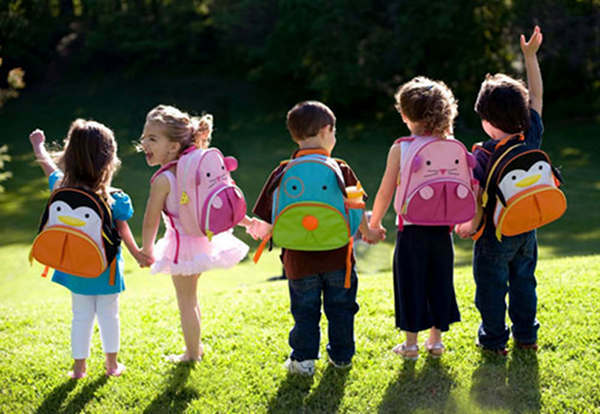 This is the first in a series of posts about daycare products which we’ve divvied up into categories – today we’re entering the wonderful world of backpacks! On a serious note, there are risks to your child’s spinal health from carrying an overloaded backpack. Make sure you buy the right size backpack for your child and pack it with no more than ten per cent of his or her bodyweight. 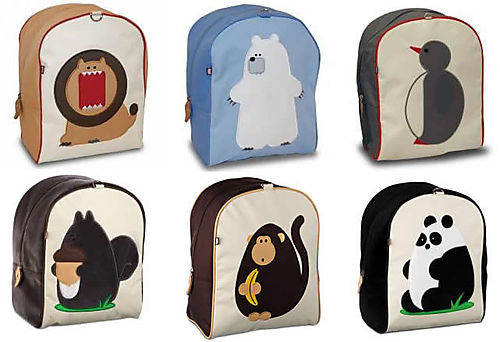 Made by popular company Skip Hop, Zoo Backpacks are perfectly sized for small children. 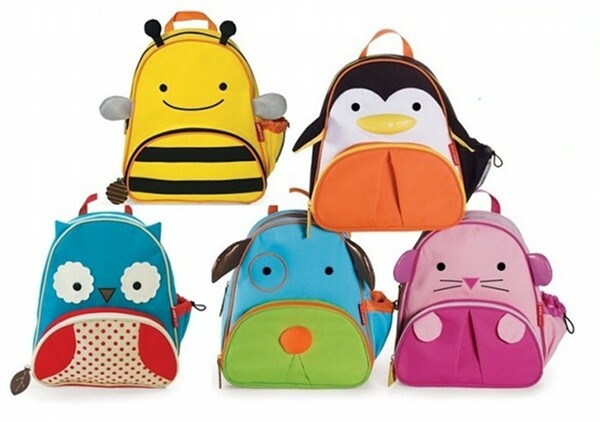 The bag is available in six different animal designs – a dog, bee, penguin, mouse, monkey and an old favourite, the owl. 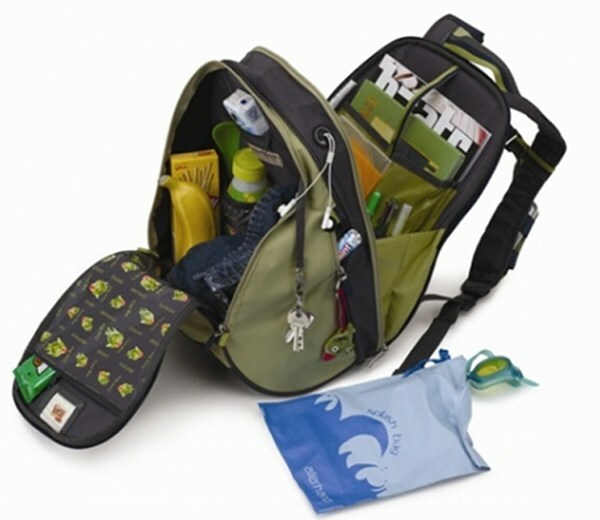 The Zoo Pack features comfortable padded straps and plenty of pockets for treasures, snacks and water bottles. 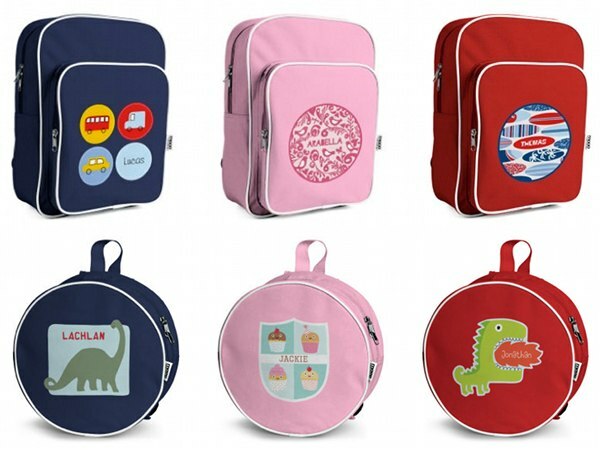 Children won’t be swamped by the size of these backpacks, at 29x25cm they’re perfectly sized for small children. 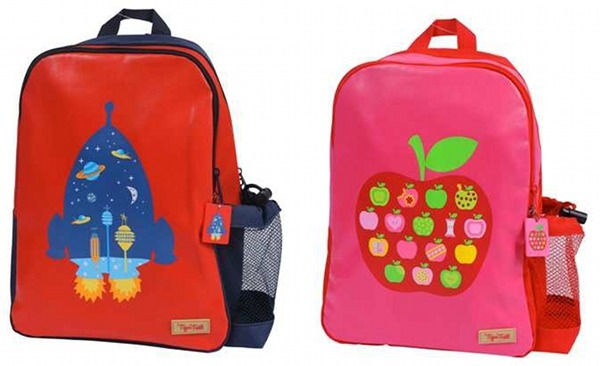 They’re $39.95 each from Urban Baby, where you can also buy matching Lunchie bags. We love these new designs from Tiger Tribe which are available for $31.95 from Haggus and Stookles along with many other backpack designs. Visit the website to see plenty more back to school gear. 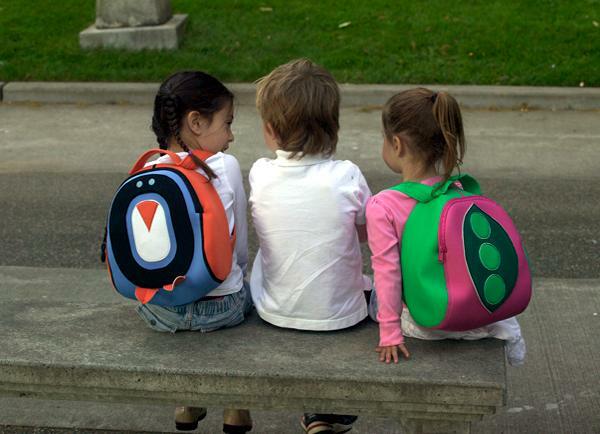 Bright, personalised and roomy, the backpacks from Mooo are customised by you and delivered to your door. Go for large, medium or mini, depending on the age of your children and what they’ll be using them for. Prices start at $39.95. 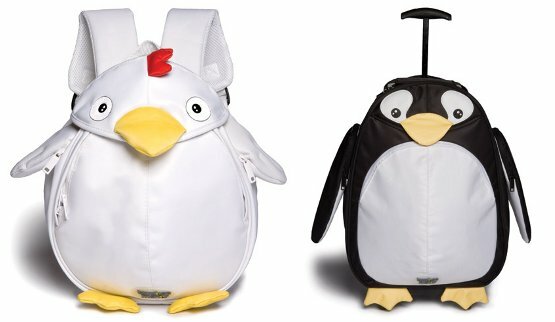 Cute as a button, these backpacks by Dabbawalla come in six different designs including a penguin, peas in a pod, traffic lights, elephant, flower and racing cars. They’re $49.95 each at Gear 4 Baby. Winner of the UK ‘Practical Preschool’ Gold Award, these quirky little creations from Busybee Friends are just plain adorable! The character choices are ‘PengPeng’ Penguin, ‘Cuckoo’ Chick and ‘Quackie’ Duck. The ingenious design of these bags is evident throughout. 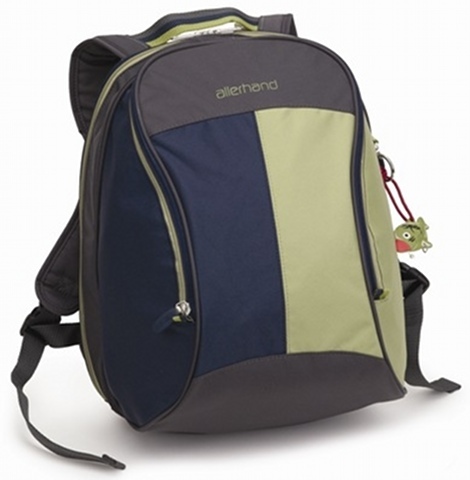 The backpack has a removable wing to use as a pencil case (so cool) and every little space is used wisely and efficiently with many compartments and enclosures for little keepsakes. Available from Urban Baby for $49.95. You’ll need to look overseas next up as this brand hasn’t come to our shores yet, but they are super-cute! Dante Beatrix bags hang from the shoulders of celeb kids and are lovely quality. They come in a range of sizes too from Genius Jones who will ship internationally. Perhaps you have an aversion to cute critters adorning everything your child owns. We have the backpack for you! This attractive Allerhand bag packs a punch in the features department with more pockets and zips than you can ever imagine. We think this is a great kindy to year two starter backpack and so hardy you’ll be passing it down to the younger sibling! It’s $77 from Haggus and Stookles and comes in two colours – Cool (above) and Shadow. Licensed products can be hit and miss but when two special ones have been handpicked by stylish website Little Styles, you just know they’re a bit special. 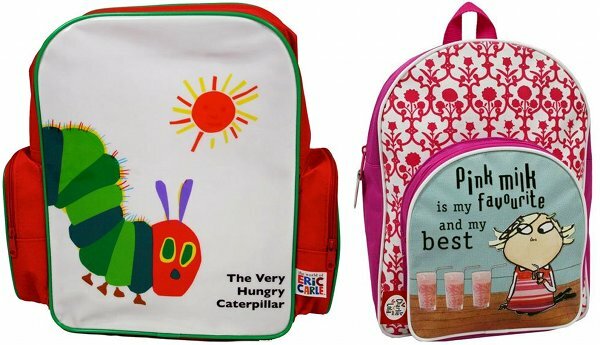 Featuring The Very Hungry Caterpillar ($24.95) and Lola from Charlie and Lola fame ($19.95), these two sweeties boast literary clout and a good dose of cute.